Just Julie B's Stampin' Space: Recycled Calendar Envelopes & Note Cards! Now that the year is coming to a close, you’ll soon be finished with your 2015 calendar. This tutorial will demonstrate how to create a set of colorful envelopes from the calendar photos. Instructions are also included for making a set of note cards that feature the same clean and simple design, but you’ll learn how to sort the envelopes so that similar and coordinating colors can be used to stamp the images on the cards. 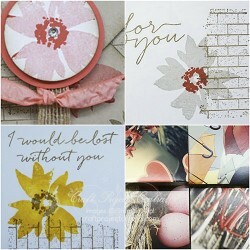 Lastly, since you may wish to give your finished card set as a gift, this tutorial includes instructions for a gift box. This awesome project was made by Regina Andari and you can get her tutorial when you subscribe to the month of December over at Craft Project Central.